Explore the Dolmabahce Palace and get caught up in the royal past of Ottoman Empire. With this guided tour, visit the palace without waiting for the long queue. After visiting the palace, see both European & Asian sides and the most important highlights of the city on the boat cruise in 2 and a half hours. Also have an opportunity to visit an Ottoman palace on the Asian side of Istanbul. After the cruise, travel through the neighbourhoods by the Golden Horn on the bus tour and have a free time on the Pierre Loti Hill. After getting picked-up from your hotel in the morning, you will be taken to the Dolmabahce Palace. The visit of the Dolmabahce Palace lasts about 1 and a half hour. After seeing the rooms, halls and the collections of the palace, you will be picked-up by bus. You will be taken to the Eminonu Pier, starting point of boat trip on the Bosphorus. You are going start to sail on the Bosphorus after sailing on the Golden Horn for a few minutes. 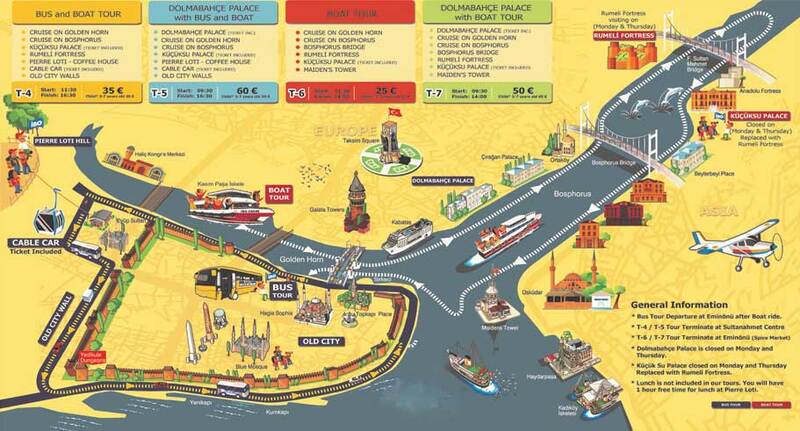 Following the European Side of Istanbul, you will sail for about 1 hour till the 2nd bridge on the Bosphorus. On the European Side, you will see many historical monuments and buildings such as; Galata Tower, Dolmabahce Palace, Ciragan Palace, Ortakoy Mosque and Rumeli Fortress. By the 2nd bridge, you will turn back to the Asian Side of Istanbul and visit Kucuksu Palace which was built in 19th century and used as a hunting lodge by Ottoman Empire. After visiting the palace for about 45 minutes, you will get on board again to see the Asian Side of the city on the way back. Following the Asian Side, you will see Anatolian Fortress, Kuleli Military High School, Beylerbeyi Palace and the Maiden’s Tower. After two and a half hours spent on the Bosphorus, you will go to the Pierre Loti Hill by bus. Passing through old neighbourhoods of Istanbul, such as Eminonu, Balat and Eyup, you will see many historical places and listen to some informations on the way, which lasts about 25 minutes. When you get to top of Pierre Loti Hill, you are going to have a free time about a hour to have lunch and to take some photos of a great view of Golden Horn and Istanbul. Then, you will have the opportunity to go down the hill by the cable car, while the bus is waiting for you down the hill. After getting on the bus again, you will follow and see the Great Walls of the Old City for many kilometers on the way back to the Sultanahmet Square. Kucuksu Palace and Dolmabahce Palace is closed on Monday-Thursday and replace with Rumeli Fortress. Rumeli Fortress is closed on Wednesday and replace with Kucuksu Palace. At last, you will be dropped off at the square, nearby of the Blue Mosque.